Accepted Scientific Name: Crassula tomentosa Thunb. The plant dies after flowering but it does form multiple heads, so some of these will continue even if the main head dies. Origin and Habitat: Southern Namibia and Republic of South Africa (Northern Cape, Western Cape). 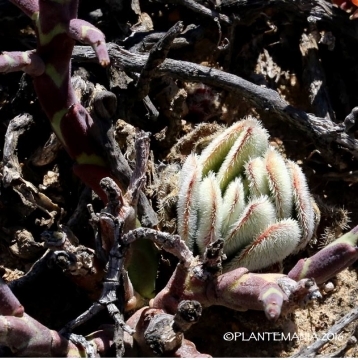 Habitat and ecology: Succulent and Nama Karoo. This species grows on stony slopes together with other succulent species such as, Euphorbia mauritanica, Pelargonium crithmifolium, Othonna cylindrica, Tylecodon paniculatus, Crassula muscosa, Conophytum bilobum, Ornithogalum multifolium, and Sarcostemma viminale. Description: Crassula tomentosa, or woolly crassula, is a perennials or biennials succulent with one to few, rarely many rosettes, compact rosettes of greyish green leaves to 60 cm tall (including the inflorescence). Everywhere is densely clothed with rigid, reflexed bristly-hairs. It is monocarpic that is to say that its individual rosettes flower only once in their life, set seeds and then die. 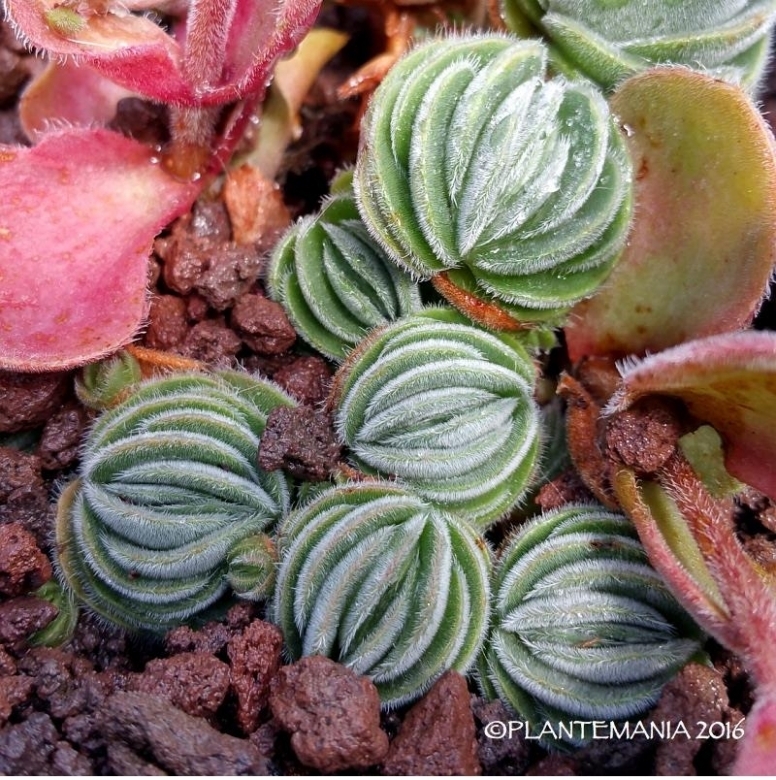 Crassula tomentosa is a very variable species (especially in hairiness and size and shape of leaves) with many slightly different forms. Rosettes: Solitary or proliferating from the base to form small groups with with leaf pairs spirally arranged but often apparently two-ranked when young and with old leaves remaining attached to stems. Leaves: Radical leaves 2-10 cm long, 1-3.5 cm broad, flattened, very variable in shape, broadly oblong, oblanceolate, obovate or orbicular, often 2-ranked and in a dense basal rosette, grey-green to green, glabrous, tomentose to rugose and with marginal cilia, tip rounded, truncate or acute; the cauline narrow-oblong, all densely hirsuto-setose and ciliate. Inflorescence: Terminal branched spike-like thyrses. Stem erect, robust, tapering upwards, to 10-60 cm tall simple, robust, densely leafy at base, with distant leaf-pairs above, the upper leaves diminishing to bracts or abortive. Flowers spreading in sessile decussate, densely clustered dichasia (flower clusters) at the nodes, lower dichasia pedunculate, forming a long interrupted spiked-thyrsus or spike. Peduncle covered with leaf-like bracts becoming smaller upwards. Flowers: Sepals 2,5-3 mm long, linear, obtuse, stiffly hairy and ciliate, round-backed, fleshy, green. Corolla tubular, fused basally for 1-1,5 mm, white to yellowhis. Petals 2,5-4.5 mm long, oblong-panduriform, fused in the lower parts, gradually tapering into a channelled apex, tips spreading slightly recurved. Stamens with black anthers. Stigma subsessile. Squamae (nectary scales) oblong to square or rarely transversely oblong, 0,3-1,2 mm long, 0,2-l mm broad, truncate and more or less constricted downwards, scarcely fleshy, yellow. Blooming season: Crassula tomentosa flowers early to mid-summer. Crassula tomentosa var. glabrifolia (Harv.) G.D.Rowley: Smaller, to 30 cm (incl. Inf); Ros densely branched, tight; Leaves less than 15 mm long, with truncate tips. Distribution: Northern Cape, Western Cape. 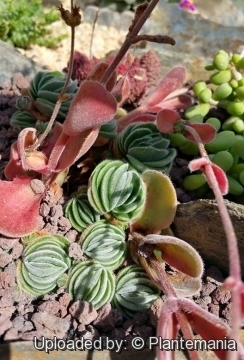 Cultivation and Propagation: Crassula tomentosa is a one of the most frustrating species to grow, but properly grown, in a compost that is not too rich, in a good light, and not overwatered, a single rosette will become a beautiful sight as the leaves curve inwards and the plant assumes the appearance of a hairy ball. They are often grown in small bonsai pots. Growth rate: It is a pretty fast grower. Soil: Plants grow well in a well-drained mineral soil. Pots: It needs a relatively shallow pot to accommodate its fibrous roots and provide a very good drainage. Exposure: It cannot take direct sun in summer, too much sunshine and the leaves will scorch, but generally needs sun part of the day to bloom. In deep shade it gets pretty weak and eventually rots and dies. As houseplants, give crassulas up to 6 hours a day of sun. Watering: It needs moderate water – not too wet nor too dry from autumn to spring with regular water in summer (careful watering required in winter), insufficient water and they will shrivel; too much water and the rosette will open up into a hairy cabbage. Pest and diseases: It does not suffer from pests, other than the occasional mealybugs. Protect against frost. Hardiness: Outdoors in frost free areas, indoors all other zones. Propagation: Seeds/Offsets. Sow seeds in autumn. Place cuttings in clean river sand, mist every three to four days, roots should appear within 2-3 weeks.